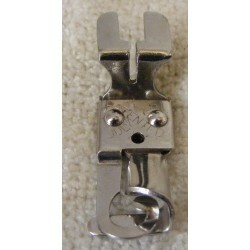 Sewing Accessories & Attachments There are 52 products. 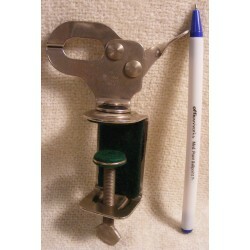 This great sewing aide clamps and holds your fabric while you are working. 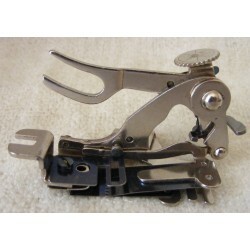 Called the Material Gripper and made by Singer. Screw the clamp onto your table or cabinet and clamp the material in the top part to securely hold your fabric while working. The head rotates 360 degrees for more ease and functionality. Older, used sewing machine base and holder. All wood construction. 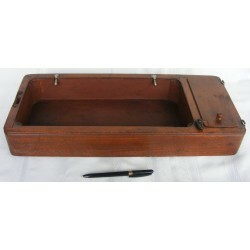 Perfect to hold your vintage sewing machine while sewing or being stored. Wooden, sliding lid covers the sewing machine accessory compartment. Metal strip in front helps hold your machine into place. A nice, antique and original sewing machine base for your machine! 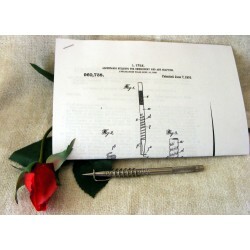 Here is a very nice buttonhole attachment to help you sew buttonholes on garments or projects. Insert the button on the side of the foot and off you go! 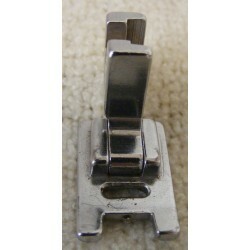 This is a nice presser foot made by and for Viking Sewing Machines. Decorative or utility stitch foot B. It has the small ditch on the underside which helps the foot glide over the thickness of satin and other decorative stitches. Original and vintage. 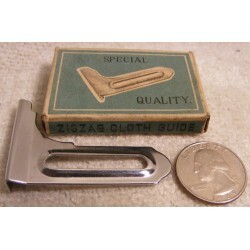 Great and fun item to go with your sewing and/or sewing machine collection! A box full of shampoo, rug protectors and instructions. 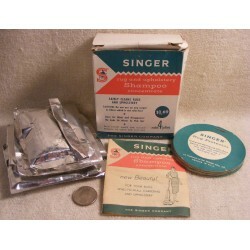 All for the rug and upholstery shampoo machine Singer also made. The original box has the pinkish-red and green colors Singer used in the 60s. 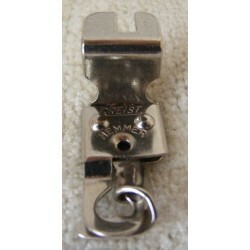 Fix and darn your socks with this Singer sewing attachment. Part No. 35774. Easy to use. You can fix all of the holes in you and your family's socks faster than by doing it by hand. Save money on socks by using this handy Singer stocking darner attachment! Bind your quilts, make your own piping, create beautiful edges for your sewing projects with this presser foot from Greist Manufacturing. 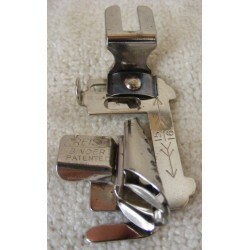 Vintage and original, metal sewing accessory for rotary sewing machines. The internet is full of the many different things you can sew and make with this Singercraft Guide. Besides rugs this handy attachment from Singer Manufacturing can also help you sew your own trims as well as other projects. This one is a No. 2 and from around the time of World War II. All black coloring, it is a blackside. 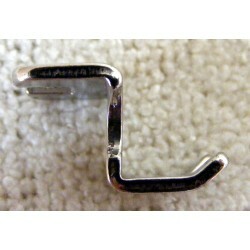 Made by Greist Manufacturing, this ruffler is top clamping and is used by vintage, rotary sewing machines. A great sewing machine attachment for making ruffles and pleats. Original and vintage. 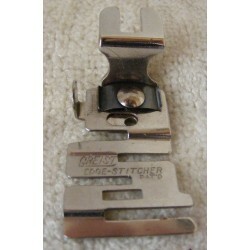 A great little sewing machine attachment for making 3/8th (.635cm) hems. Fun to watch as it catches and folds fabric as your machine stitches. Top clamping and for rotary sewing machines. 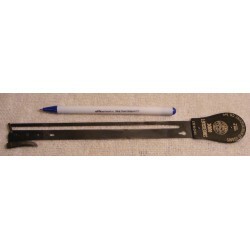 The shank is a little different in size being between the usual low and high shank at 5/8th inches. The notch in the top is slightly to the right of center also. Sew 3/8th in. 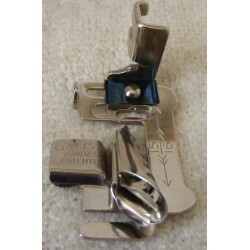 hems quickly and easily with this presser foot! Fun to watch as it catches the fabric, rolls it for you and quickly stitches the roll holding the hem in place. Marked Patented July 7 ' 91 on it. Most likely from the year 1891. 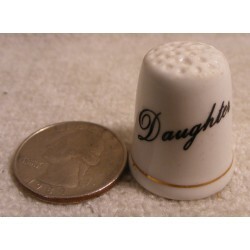 This is a sweet thimble from Ashleydale in England. Great for your collection or a gift for your daughter. Gold trim and lettering and floral design on one side. Marked: Fine Bone China, Ashleydale, England. 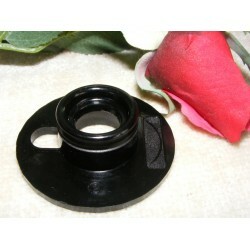 Great little quilter foot designed for top clamping sewing machines. All metal construction. 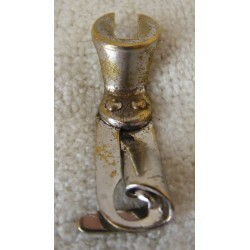 Original, vintage sewing machine foot.